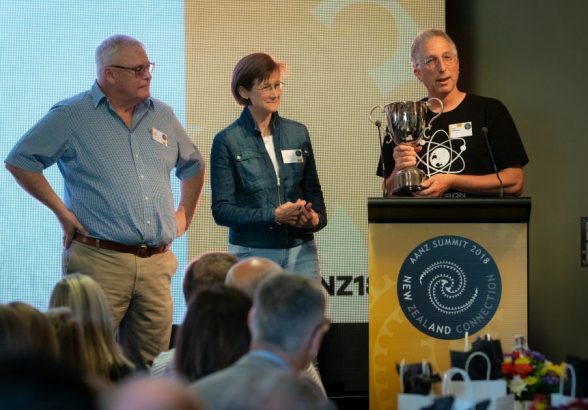 One of New Zealand’s true champions of kiwi start-ups and angel investment, Dave Moskovitz, was awarded the Angel Association New Zealand’s (AANZ) Arch Angel Award at the 11th Anniversary NZ Angel Summit in Blenheim. The award recognises the significant amount of time and money angels contribute to startups and early-stage companies – and specifically to their founders and teams – to help them reach their potential while also recognising angels who make a significant difference to New Zealand’s start-up ecosystem. The recipient is chosen by the previous years’ winners. Dave has been investing in early-stage companies for a decade and been an investor director for a number of the ventures he has backed including ShowGizmo, The Appreciation Engine and Jaipuna. Most notably he was at the helm of peer-review publishing platform, Publons as Chair when that venture exited to UK-based Clarivate Analytics last year. Dave has held governance roles with Wellington-based AngelHQ and was one of the founding fathers of New Zealand Start-up Weekends. He has mentored for 9 accelerator programmes helping dozens of ventures to secure funding and grow their businesses. Dave is an active member of InternetNZ, a member of the council of Open Polytech and was recently appointed to the Ministerial Advisory Group for Digital Economy and Digital Inclusion. He is also New Zealand’s representative to the Global Business Angel Network. Former Arch Angel winner, Andy Hamilton, says one of the hallmarks of Dave’s work has been the importance he places on the role of empathy in business success. “Dave takes a very genuine interest in supporting not just the success of the founders he backs, but also their wellbeing,” he said, noting that being a founder can be a very personally challenging role. 2012 winner, Movac’s Phil McCaw, who has worked with Dave over the years in the Wellington start-up and early stage investment scene, said Dave’s contribution to angel investment and start-ups in New Zealand is significant. Speaking earlier in the year to Simon Morton on Radio New Zealand, Dave spoke with deep and personal insight about how successful angels and founders recycle skills and capital generating a virtuous cycle of further start-ups and cutting-edge roles in disruptive industries. He also spoke enthusiastically about the role start-up methodology could play improving the delivery of government services. Dave received his award at the 11th Anniversary NZ Angel Summit, held at Marlborough Vintners in Blenheim and attended by 150 delegates. The annual event provides a hub for angels to learn and network, and is recognised as one of the world’s top angel events. American born, Dave came to New Zealand over 25 years ago. He attended the University of California, Berkeley where he majored in computer science. He is one of three migrants to win the Arch Angel Award. Former Arch Angel winners include The Warehouse founder and long-time angel investor Stephen Tindall; Andy Hamilton, chief executive of The Icehouse and member of IceAngels; US super angel Bill Payne; veteran angel investor Dr Ray Thomson; prolific AngelHQ member, Trevor Dickinson, former AANZ Chair, Marcel van den Assum and ardent angel investor, Debra Hall.